You may have heard of Yum Yum. There’s about 25 in Hell’s Kitchen. Maybe you’ve seen them. Yum Yum Queens, a distant relative of the aforementioned, serves up tasty Thai at cheap prices. With no frills, the restaurant delivers an inexpensive lunch special and a filling prix fixe dinner. If you’re in the neighborhood at mealtime with a bunch of change in your pocket, this is the place to go. Last night, my dining partner and I ordered in. As an appetizer, we got the fried tofu. 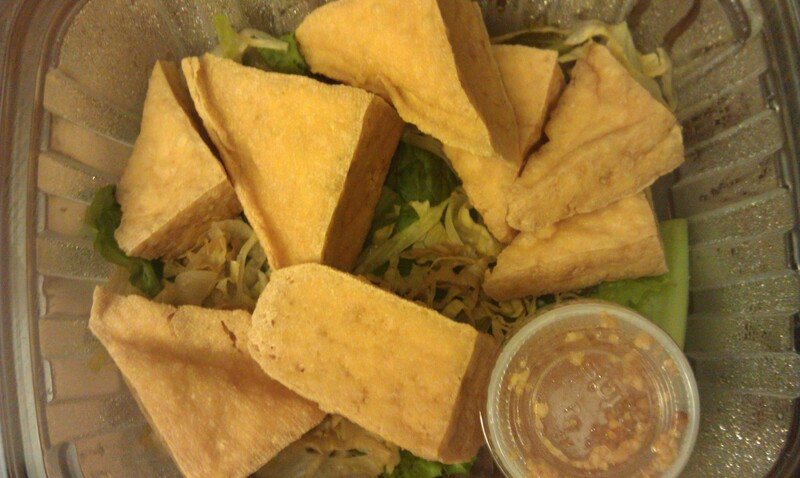 Cardboard-like and triangular, the fried tofu wasn’t exactly disappointing but not flavorful either. I mean, it’s tofu. What can you do with it? A special sauce accompanied the dish. We drizzled it all over the tofu, in hopes to make a more delectable offering. It helped slightly. Another appetizer we typically try is the curry puffs, which are small, empanada-like pastries filled with chicken and spices. They are quite good and I highly recommend them. For an entree, I ordered the green curry with chicken. I’m fond of Yum Yum’s curries. I usually order the red curry, but fancied something spicier last night. It is chock full of bamboo shoots, green beans, and other vegetables, including something that resembled a type of eggplant. I was very satisfied with my dish. My dining partner got the Pad Kie Mow with tofu, which was greasy and delicious. 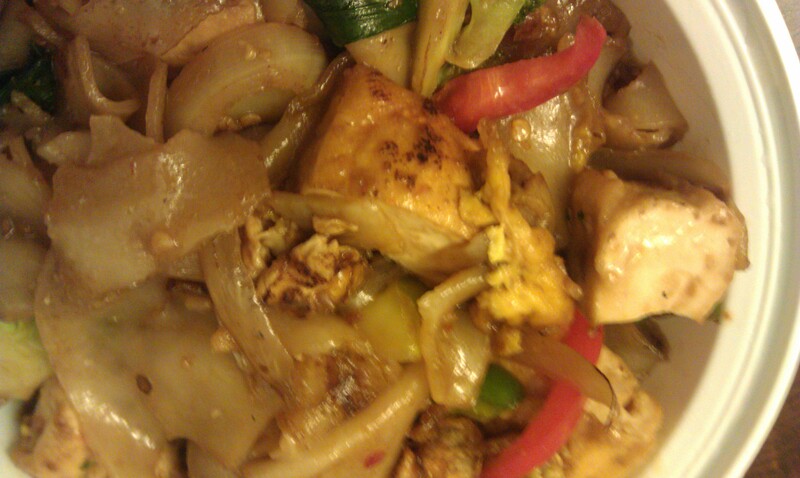 The tofu was tough, but had absorbed all the grease and juices oozing from the flat noodles. It was wonderful. Don’t forget to try the Thai iced tea and coffee. They are expertly served at Yum Yum. Overall, you get the bang for your buck at Yum Yum Queens. It’s not worth traveling to Sunnyside for this restaurant, but if you’re in the ‘hood, you definitely want to try this Thai. Take the 7 train to 40th street and walk three blocks.